Baked Spaghetti Casserole is a spin on a classic dish: red meat sauce layered with spaghetti noodles and lots of gooey cheese. It is perfect for feeding a crowd or save half of the dish for dinner another night. 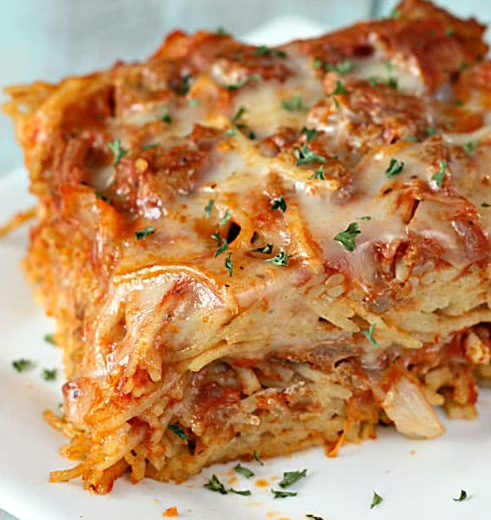 This Baked Spaghetti Casserole is a family favorite and so easy to make on a busy night. Everyone will love the classic comfort of spaghetti – red meat sauce, warm spaghetti noodles, and lots and lots of gooey cheese – all layered together in a simple 9×13″ baking dish. Make this dish a day or two in advance, keep covered in the fridge, and pop it in the oven when it’s getting close to dinner time. For this recipe, you start out with a package of spaghetti. Recently our family made the switch to whole wheat pasta (which works great for this recipe! ), but any kind of pasta will do. You will also need 1 jar of your favorite meatless spaghetti sauce (I’ve been on a Prego kick lately, but any kind will work). I also used a lean ground beef in this recipe, but ground turkey will work perfectly as well. I have found that ground turkey can be subbed for ground beef in almost any recipe (this one included). Another option would be using ground Italian sausage in place of the ground beef – I love using sausage when I make spaghetti and think that it would be delicious in this dish. Many of our readers have asked what they can use in place of cottage cheese in this recipe. I like using cottage cheese in this recipe because of the extra moisture that it provides, but many of our readers have done a swap with ricotta cheese and LOVED the outcome. I also like using cottage cheese because it has fewer calories and it is usually an ingredient I always have in my fridge. 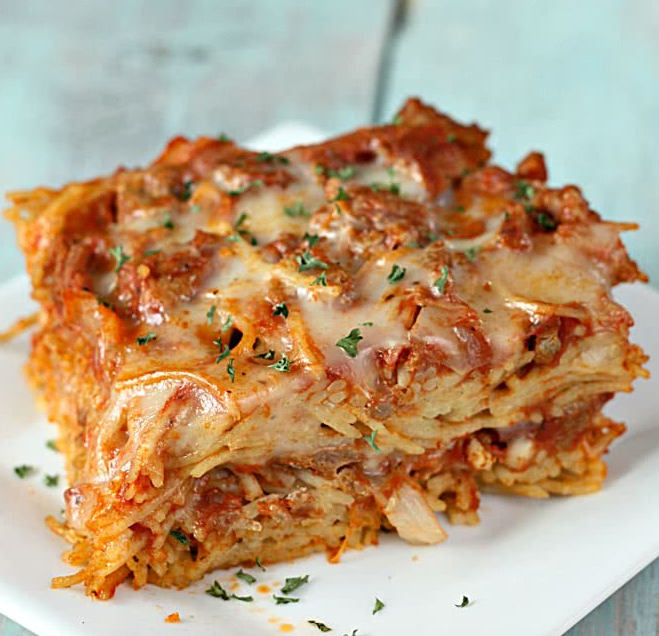 However, I love ricotta cheese in lasagna and feel that it would be a great substitute in this dish. If you try it, please leave a comment below and let us know how it worked! If you want to make this dish as a freezer meal, make sure that you use a freezer-safe dish and follow all of the same directions until it says to bake the casserole. At that point, make sure that you top the dish with foil (or the included lid – you just want to keep it from getting freezer burned) and place it in the freezer. I would recommend that you eat the dish within 30 days. When you are ready to bake the casserole, remove it from the freezer 24 hours in advance and place it in the fridge to thaw (otherwise you are going to have to add 1-2 hours to your baking time and you might end up with some overcooked noodles). You can then just follow the regular baking directions and your family and friends will rave about the delicious meal you prepared. 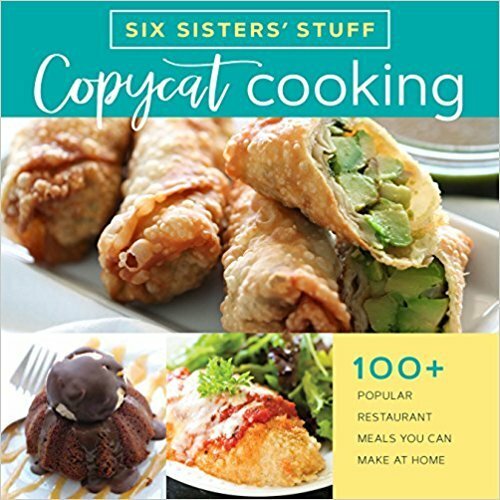 Six Sisters’ Stuff COPYCAT COOKING <—- Click here to order! In this video we are sharing the perfect side dish for Baked Spaghetti – Cheesy Garlic Bread. Our family loves spaghetti too! I am going to make this asap! Thanks for the recipe and what a great blog you have! I think this would be a great back to school dinner with fresh salad and bread! Made this tonight! Killer! Easy and so delicious! Yummmm! Who doesn't love spaghetti?? I could live off it too! This dish is striking me as something I want for dinner. Can I really change my weekly menu on Monday? Ah, I just love everything you put on here! This is FAB-U-LOUS!! cooking this tonight :) My husband loves spaghetti!! I thought the same thing when I first made it, but it seemed to come out just right! Let us know how it goes! I've got this in the oven.....it's smelling GREAT!! Did you freeze it after baking it or before? Megan - Jodi's response to this question is incorrect. You bake it first, let it cool, then cut it into individual serving-sized portions. Wrap each portion in foil or put it in a Ziploc baggie, then put the wrapped portions on a baking sheet in the freezer until they're frozen solid. Once frozen, you can stack them directly on the freezer shelf. These can be microwaved directly from the freezer, but they tend to end up a little tough around the edges before the middle gets hot, so I like to thaw them out in the fridge overnight. I can't stand cottage cheese....you think it would be just as good if I left it out? It is GREAT with out the cottage cheese. I didn't substitute it for anything either, just left it out completely and it was so good. I used extra sauce though, b/c I ran out the first time. Just a little tip - if you like sauce. Def give this recipe an A+! I've had so many people ask me for it b/c they liked it so much! You can also use ricotta cheese instead of the cottage cheese. I am 1/2 Italian and we cringe every time we see an "Italian" pasta recipe that calls for cottage cheese. YUCK!! Ditto! I also will not use cottage cheese in pasta recipes. I used Ricotta cheese and this pasta dish was great! Yay to this answer! Pinning now! Thank you for asking this because my husband feels the same way yet it sounds delish! I have never tried it without cottage cheese but I am sure you could substitute it with a little ricotta cheese or try omitting it. Let us know how it goes! Yes, I have made a very similar dish with neither the cottage cheese nor the ricotta. I love zucchini so I included that. Everyone, including picky grandchildren love it. Phenomenal! I will be making this again...and again...and again! Hoping the leftovers are just as tasty! Im a new follower. As soon as i saw this recipe i decided to try it and it came out great! Hopefully i will get a chance to blog about it this weekend! Made this baked spaghetti last night using lean meat and fat free/low fat dairy products and it was still delicious : ) Hubby ate two big plate fulls. Would be great for company. I saw you suggested using ricotta if you don't like cottage cheese. I want to use ricotta because that's what I already have on hand :) Would I use the same amount of ricotta? Yes! Just use the same amount! This was AWFUL! Save your time and ingredients. Find another recipe or just make some plain ol spaghetti. Funny your the only one with a negative comment..
Made it tonight for dinner and was YUM!!! Only cooked it for 30min and turned out fine! I am so happy I found this recipe here! I couldn't find it on All Recipe's website anymore and this is my favorite one! It is so good! I omit the cottage cheese and use more sauce, the 26oz jar didn't seem to be enough the first time I made this, but it was a HUGE hit! I had a group of friends over when I made this and they loved it. The guys couldn't get enough! Sent leftovers home with everyone :) Very good recipe! I guess it doesn't turn out as good without the cheese...but still tastes incredibly delicious! If I want to freeze this should I bake it before freezing it? Thanks! If I want to freeze this, should I bake it before or after freezing? Thanks! You can bake it before you freeze it. Then just thaw and reheat! I make something similar to this (no meat) and use ricotta instead of the cottage cheese. I bake it in a pie dish and call it spaghetti pie to entice the kids. Serve it in pie slices and everything. They love it. I've been making this exact recipe for 12 years but I only bake it for 35 minutes covered and 5 minutes uncovered. It's the best! Glad to see so many people enjoying it. You guys always find the best recipes! I found this recipe on Pinterest. We made it without the cottage cheese and it turned out great! I am planning on making it again, but adding extra sauce. My husband and son loved it! Said it was better than baked spaghetti from one of our local Italian restaurants! Loved this recipe!!! I baked half in an 8x8 and froze the other half to bake later! My hubby even asked if I can remember where I found the recipe so I can make it again! I was so excited for this recipe, but I was disappointed. I thought it turned out kinda dry and there was definitely not enough spaghetti sauce even though I used a larger sized jar. I would not make this again without some heavy tweaks. Hi, If I cut this recipe in half and put it in am 8x8 or 9x9 pan, how long should I cook it? Thanks! You could reduce the cooking time when making this in an 8 x 8 pan. We don't have the exact baking time for you. Be sure to watch it closely. The main thing is that it is heated all the way through and the cheese is melted. I love this recipe, i use about 3/4 pounds of ground beef and i substitute the cottage cheese for ricotta. I've made this numerous times and love it every time. Thanks for a great recipe! Could you be more specific about the "seasoned salt" ingredient? Also, what are your thoughts on substituting 1 lb. of bulk sausage for the ground beef? There are many brands of seasoned salt. Any of them will work fine. We often use Lawry's. Bulk sausage should work just fine in place of ground beef. This looks great, but here's a question. If we don't like Parmesan, would you suggest using a different cheese or just omitting it? You could omit it or Mozzarella would be good and cheesy! This recipe is so delicious!!! My whole family loves it, including my 1 and 4 year old! Definitely going to be making again! I made this recipe a few months ago. It was wonderful. My young adult son works weird hours. He liked it so much he said he could eat it everyday. He also said I should keep the leftovers on hand frequently because he would love to have it as a go to food for lunch or dinner on a busy day. It took a little bit of time to make but the leftovers were great. Well worth the effort. Thanks for this great recipe. I was worried about comments on it being dry but stuck to the recipe and it was perfect! Far from dry. Maybe others mismeasured or just like a dripping spaghetti. It was very moist but not watery. It had a great taste and all 5 of my very picky eaters loved it. I just had to keep it a secret that it was cottage cheese, until of course they were done. We will definitely be making it again. Maybe next time I might use Italian sausage instead of ground beef. This is an awesome recipe. My husband and I both love it!! This looks delicious and doable for me, so I'm considering making this for a Pot Luck dinner. How many servings does this make because I need to have a dish that serves 15 people? Made this last night. Used ricotta instead of cottage cheese. My husband, who is extremely picky and doesn't care for spaghetti the traditional way, LOVED it. When I make it again, I will use more sauce, but that is just a personal preference. Turned out great! Having leftovers for lunch today? I made this last night and my son and I really like it but my husband thought it didn't have enough sauce in it, which is what I liked about it, lol! So I guess I'm going to have to find a way to add some sauce but not too much for a happy medium. Thanks Raiya! You made our day! Subbing cottage cheese for ricotta? Wish me luck!! Looks great! We have only made it as directed on the recipe. You will want the cottage cheese because it gives the recipe some moisture. I want to make this for a friend. I'm going to freeze it. I've read the comments. From what I take you bake it. Then freeze it. Thaw it in the overnight fridge before baking. My question is how long do you bake it after it is frozen and at what temp? I want it to turn out delicious for her and her family. Thanks!! Delicious but how did you all fit it into 1 13 X 9 baking dish. I had to use two baking dished with just 1 layer of goodies each. Still yum. I love this recipe. It’s easy and good and makes a lot! Your prep time allowance of 10 minuets is totally wrong though. I cook regularly and feel like i can easily read a recipe and then make it myself...I could never prep this in 10 minuets. Fresh grated Parmesan or the bottled powdery kind? You can use fresh grated Parmesan Cheese or the kind that you shake out of the bottle. They will both work fine. Could I substitute spaghetti squash for the noodles or do you think it might be watery? Hi Vicky. That sounds amazing by adding the baked spaghetti squash. Spaghetti squash has a lot more moisture in it. We have not tried this recipe using spaghetti squash in place of the pasta. Sorry, I wish we were more help. If there is a way to get a lot of the moisture out with a paper towel. It might be worth trying. Any suggestions for egg substitute? We have an egg allergy in the family. Would an egg replacement powder work? We have not used an egg replacement for this recipe. If you use them in most of your recipes and they work well as a substitute, I'm sure it would work in this recipe too. You mentioned an alternative would be to use baked chicken and Alfredo. Would you make it exactly the same way just subbing Alfredo sauce for tomatoes and tomato sauce? Same amount of Alfredo? Just replace the spaghetti sauce and ground beef for chicken and Alfredo sauce and make the same.